Another of my Mom’s incredible recipes that is a perfect way to celebrate the summer and all the delicious berries it has to offer. Getting the stages of “peaks” down can be intimidating, but it is really just about understanding what you are looking for. 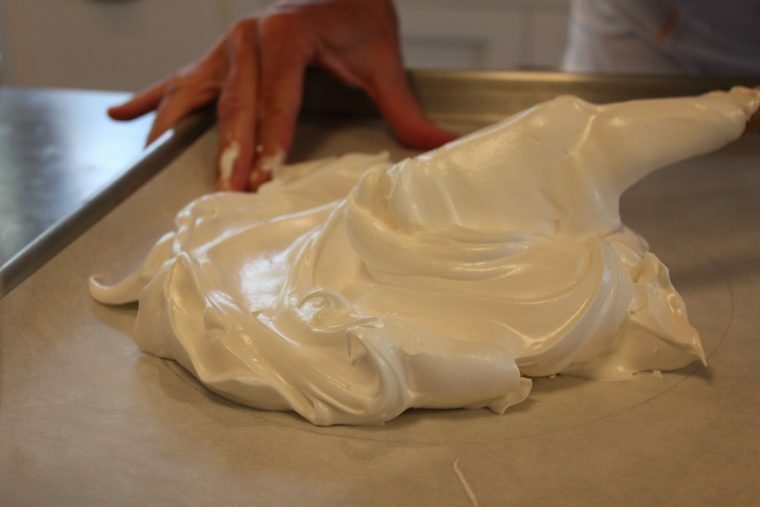 Soft Peak is when the egg whites start to stiffen and will hold a peak momentarily before melting back into itself. 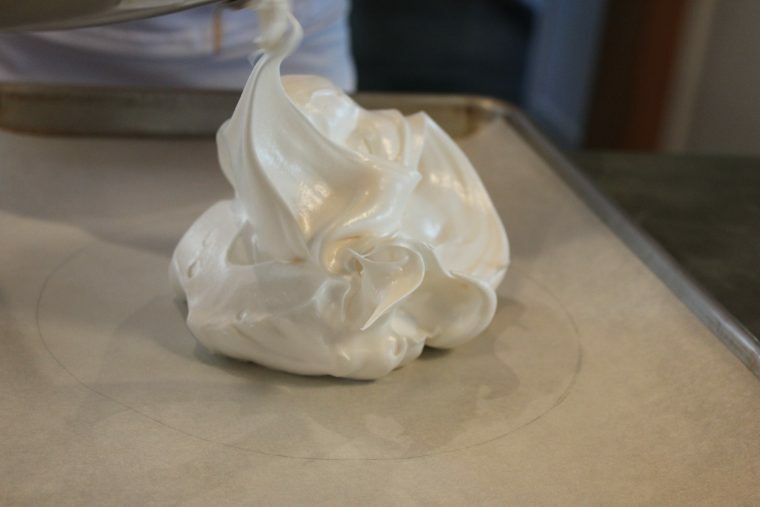 Firm Peak is when you turn the whisk upside down and the peak holds but droops slightly. Stiff Peak is exactly as it sounds, turn the whisk over and the points should hold without drooping. *Take note of what the whites look like with the mixer running at each stage so as you do this more and more, you are able to identify the stage without having to check. Thats when you know you are a pro! Heat oven to 200°F and trace two 9-inch circle on two sheets of parchment, turn them over and use to line baking sheets. 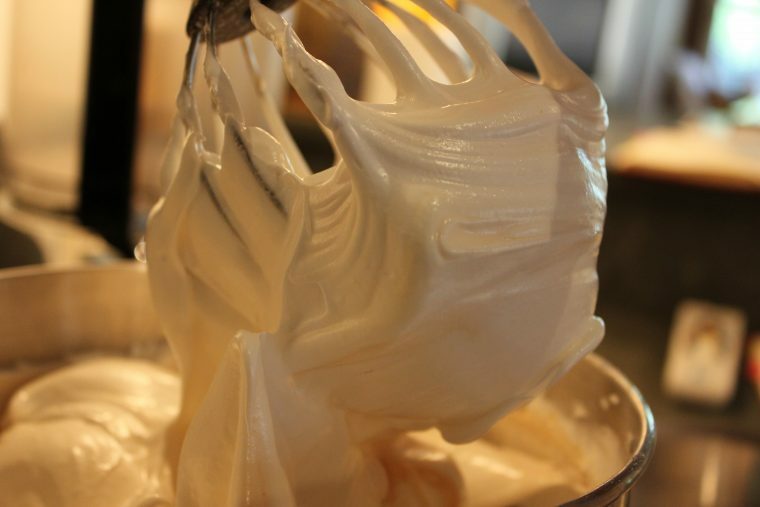 Place egg whites in bowl of electric mixer. beat on high until soft peaks form, about 2 minutes. With mixer on high slowly add 1/4 cup sugar. Continue adding the rest of the sugar, 1 tbl at a time, until whites are very stiff and glossy. Add 1 tsp vanilla, beat until just combined. Divide batter between traced circles and spread to edges of circle. Place in the oven and bake for 3 – 3 1/2 hours, rotating once, until firm and sound slightly hollow when tapped. Make Sauce: combine raspberries, sugar, and lemon juice in a small saucepan over low heat. cook until berries release their juice and just start to break down, about 5 minutes. use a rubber spatula to press berries through a sieve (fine mesh strainer), discard solids and refrigerate. Place on table when ready so everyone can pour the sauce over their own piece. Combine cream, remaining 1 tsp vanilla, and 2 tbl confectioner’s sugar in the bowl of a stand mixer and beat until stiff peaks form. 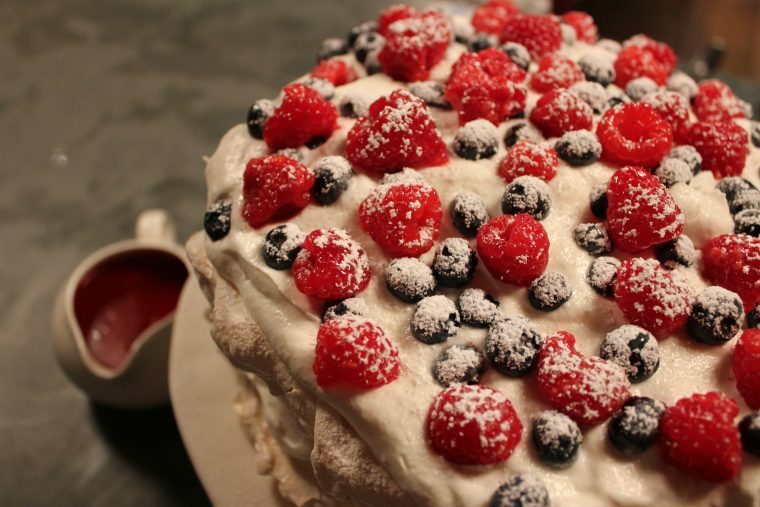 Place one meringue on serving plate and spread 1/2 of whipped cream on top, then half of the berries. 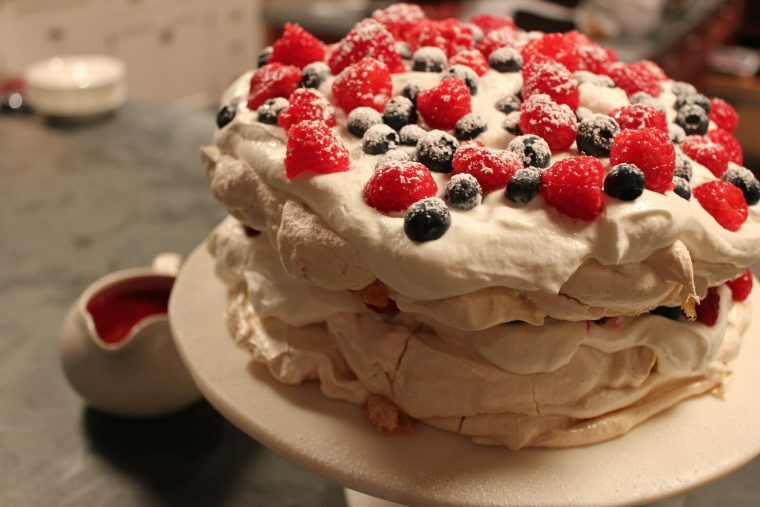 Place second meringue on top, rest of the cream and berries. Dust with confectioner’s sugar.